"The Best AFFILIATE TRAINING Videos You've Ever Seen - And Now You Can Use Them to Grow Your Business, Impress Your Customers... And MAKE MONEY!" There are only 24 hours in a day. You could churn out buckets of content nearly every day and still not have enough. Certainly you wouldn't have time to do anything else if all you did was create content! 2. Hiring a writer is expensive. Have you shopped around lately? Good content is expensive. It may be worth every penny, but maybe you just don't have that kind of a budget right now, or maybe you don't want to waste months and months of your time hunting for good writers amidst the sea of mediocre talent the outsourcing sites are awash with? It's discouraging. And it can make you feel like maybe you'll just have to settle for less content, which means growing your business slower and perhaps pushing your goals further back into the future. Simple: You just purchase the currently discounted PLR license to these 2 high-quality video training courses below! You see, using PLR content SAVES YOU TIME. Either you use it as-is (no work required!) or you spend just a little time tweaking and re-branding this premium quality training as your own. Either way, in just minutes you'll own the rights to not just one but two of the most comprehensive 'affiliate marketing success' programs you'll ever find online. And Yes... You can set your name as the author to instantly grow your reputation as the 'go to guy' in your marketplace! The other big benefit here is you SAVE MONEY! If you hired a researcher, a writer, a copywriter and then a video specialist to recreate these two courses and their sales materials, you'd expect to pay at least $8,000. But you can secure a full private label license today and your investment becomes a tiny fraction of that amount - You'll still get the same high-quality training to sell to your audience, but your return on investment will be stacked far higher and it'll arrive almost instantly because everything is ready to go right now! Let's bulletproof your affiliate marketing business. Let's reinforce it from the ground up. Because once you do, you'll start enjoying more traffic, a bigger list, and more sales than you ever thought possible. Video 1: The Surprising Truth About Affiliate Marketing - This is important, because affiliates who don’t know the whole truth struggle with their business and suffer with small commission checks. But once you know how to think like a super affiliate, you’ll be able to take your business to the next level. Plus you’ll find out what kinds of niches make the very best targets... and for one very surprising reason. Video 2: How to Uncover the Hottest Markets Around - The easiest money you’ll make as an affiliate marketer is when you put offers right under the noses of people who are already buying stuff like crazy. You’ll find out how to uncover these markets – you’ll even get a really slick strategy for discovering niches you never knew existed! Video 3: How to Find a Golden Needle in an Affiliate Marketing Haystack - Once you start doing your research, you’ll quickly discover there are tons of products for you to promote. But if you pick the wrong one, you’ll get your reputation dragged down faster than a feather tied to a bowling ball. Don’t settle for small commissions and products that won’t sell – this video will show you how to pick the right products for maximum profits! Video 4: Hooking the Hungry Fish With Juicy Bait - Listen up, everyone and their uncle is trying to get their hooks into your prospects. So you need to get these prospects on your mailing list fast before your competitors beat you to it – and that’s why this course shows you how to bait your prospects with an irresistible free offer. You’ll love seeing the huge number of new subscribers joining your list every day. Video 5: The Nuts and Bolts of Assembling Your Lead Magnet Page - If you’ve never put together a lead page before, don’t worry – it’s easier than assembling Ikea furniture, and you won’t have any spare parts left over. That’s because you’ll discover the absolute quickest way to get a professional, high-converting page up and running fast. 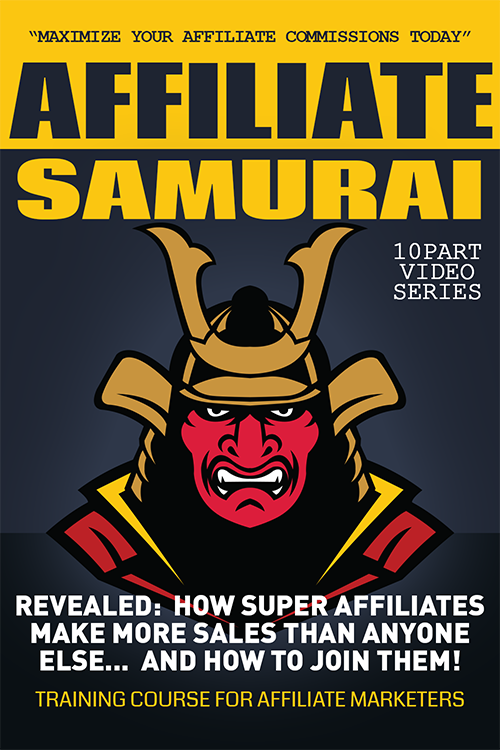 Video 7: How the Super Affiliates Make More Sales Than Everyone Else - You’ll want to pay attention to every second of this video. You’ll find out the #1 secret that separates the super affiliates from the super broke affiliates… this may surprise you, and it’s the one thing that will make your affiliate business pay you like a broken slot machine! Video 8: The Secrets of the Ugly Guys Who Date Super Models - You know what we're talking about here. Ever seen an ugly guy with an extremely beautiful woman and wondered how that happened? We’ll tell you what happened – the guy has a mesmerizing way with words. Just like politicians do. Just like teenagers do when they’re trying to borrow the car from mom and dad. And just like you will by the time you’re finished with this video. You’ll get a crash course in how to get inside your prospects’ head so you can say the right words that get them scrambling to the order button. Video 9: An Astonishing Way to Get Vendors to Send Traffic to You - This is pretty amazing if you think about it. Typically, your job as an affiliate is to whip up some targeted traffic and send it to the vendor’s sales page. But smart affiliates know a trick for turning this model on its head. You’ll find out how to get vendors to promote your site, send you traffic, and generate sales for you. It’s crazy! Video 10: How to Get More Eyeballs in Front of Your Affiliate Offers - Here you’ll find three of the top ways to attract cash-in-hand prospects to your website. Once you get these leads on your list and warm them up, then you can send them to your affiliate offers so you can start pocketing those big commission checks. Training Your Buyers Will Love! Skip these beginning steps, and any affiliate business will be about as a strong as a house of cards... ready to come toppling down at the first sign of a light breeze... All your customers have to do is dive into these 10 awesome training videos and soak up the info then apply the strategies. Check Out This Sample Video From This Series! Video 6: How to Put the Magnet in Your Lead Magnet - Most affiliates know they need to lay out an enticing bit of bait on a lead page to capture prospects on their list… but they have no idea how to do it. This video gives you four surefire tips for creating lead magnet pages that attract subscribers almost like magic. Video 7: How to Keep Your Prospects From Running Off With Your Competitors - Here’s the shocking secret: your prospects just aren’t all that into marketing monogamy. Sure, you want to be the one and only affiliate marketer for all your prospects, but you’re competitors are totally flirting with them. This video will show you how to train your prospects to come to you FIRST whenever something new hits the market. Video 8: Affiliate Marketing Like a Boss - You know what? Lots of affiliate marketers are pretty clueless about what makes customers take out their wallets. That’s good news for you – because when the majority of your competition has no idea what they’re doing, it’s so much easier for you to swoop in and steal their customers. All you have to do is position yourself a certain way in your market, which will create hordes of fans and followers who hang on your every word. Video 9: The Real Secret of Generating Big Commission Checks - You see, the super affiliates know that the real key to making a ton of sales is all about the level of engagement they have with prospects. The right level of engagement gets prospects to buy something – even if they don’t want the product or their spouse says no. Now THAT’s power. Video 10: Squeezing Every Last Drop Of Value Out of Your Assets - Every day, affiliates all over the web are wasting their biggest assets. They’ve got traffic leaks so big their sites are like sieves. They’re not protecting their reputations and they’re blowing off their partners – the same partners who could turn a fledgling affiliate business into a six-figure powerhouse. Watch this video and you’ll find out how to avoid these mistakes, plus you’ll discover how to leverage your assets to create more traffic, subscribers and cash in the bank. Video 11: The Secret of Movin’ On Up to the Upper Echelon of Affiliates - You don’t need to settle for an average income. You don’t need to settle for just enough to get by. You can make more. You deserve more. And this final video will help you do it, because you’ll get three more mindset tweaks that will get you thinking – and making money -- like a real super affiliate. It’s time to take it up a notch. Prepare to have your eyes opened to what the super affiliates really do to generate commission checks that are so big it takes days for the smiles to wear off their faces! ​In just a few minutes you can be teaching your customers the mindset tweaks, the power plays and the strategies they need to explode their commissions and become an authority in any niche. promotional emails/blog posts you can use to start selling your advanced training to all your basic course buyers - These swipes are packed full of extra tips and ideas and make the perfect follow up series however you choose to use them...Just copy & paste add your sales link and you're good to go! We've also included an additional SEVEN promotional emails/blog posts you can use to provide follow up training to your advanced course buyers, these are designed to add even more value to your training offer, minimize refunds and encourage 'students' to become affiliates and promote your basic course - Just add your affiliate page link and you're set! Want to sell a book instead of a video or lead in with a book and upsell to the video version of these coaching programs? - You Can! We've included with each course, the original transcripts in .Docx format which means with just a little tweaking you can also use the content for books or written reports, blog posts and more. So how can you use these amazing courses to grow your business? Simply Sell The Courses 'As Is'. The videos are supplied to you unbranded and are ready to start selling as your own. You can begin selling the course right away in any format you choose - You get full transcripts to each video, translate them into different languages, add your own voice overs and more - License offers you unlimited flexibility. Nichify The Course Content! You're free to edit the content or rework the videos in any way you choose and could quickly re-imagine the training to suit the industry you're in. Customize it for your audience and raise your prices to match. There is a lot of awesome information here that can be customized easily for businesses online or off. Add The Course(s) To A Membership Site. The content inside these courses is choc full of useful information. Any of it would be a valued asset in a marketing or business membership site. You get 21 videos in total and easily enough for an entire membership site or a year's worth of content ready to drip deliver every month. Create an online or offline coaching program. Incorporate the courses as part of an online coaching program or even a local offline class for businesses in your area. Use the courses as the core training and add your own 'assignments' or 'hand-outs' based around it. Learn From The Training Yourself. If you're struggling to pull down the commission checks you'd like, then you really must to go through these courses yourself. They'll help you power up your affiliate game, expand and engage your audience resulting in a huge influx of sales. Think about it, for just a little more that it would cost to have basic 'student only' access to these courses you get everything WITH PLR rights - Learning & Earning all rolled up in one great offer. Nothing on the market even comes close to what we're offering here. And yet we’ve seen licensing offers with half of what’s included in this collection go for hundreds of dollars. This amazing double 'business in a box' / ready made profit funnel could easily net you thousands of dollars in sales revenue which makes this offer easily worth $1,000 or more. You get both courses, the emails/blog posts, graphics, transcripts, unbranded sales videos and your bonus private label rights training kit, all for just $297! Best of all...Your Satisfaction is Guaranteed! Order now, and you'll have a full 30 days to use these courses in whatever way you'd like. If you're not absolutely thrilled, just email us for a prompt refund - no questions asked. P.S. Look around - You won't find better courses to help you guide your customers through the 'dog eat dog' world of affiliate marketing... Order now! Even if nothing else was included but the training alone for your personal use, this would be an INCREDIBLE deal. To protect the value of these courses, you may not pass on any kind of rights to your customers. This means that your customers may not have resell, master resell, white label or private label reprint/rights passed on to them. You may not mention the names Simon Hodgkinson, Jeremy Gislason or Promote Labs as the authors or originators of this training in any way in your marketing, product redevelopment or use of this content. You cannot use any content from these courses or copy from this page as part of another Private Label product/offer. You are not permitted to give these courses away in their current 'as-is' format for free - they must be sold directly or offered as a bonus to a paid product. They must be edited, renamed and fully re-branded to be given away. You may only claim copyright to these courses or any derived product / offering developed from them after you have made substantial changes (50% minimum) to distinguish your offering from other license owners. Promote Labs Inc. reserves the right to make final decisions on any usage of the private label content purchased under this license if they are not be specifically addressed in these restrictions - If in doubt ask.